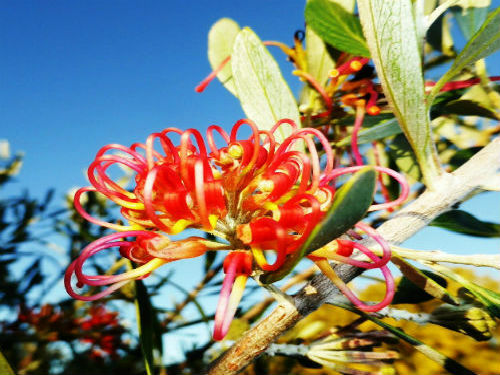 Grevillea “Apricot Glow” is said to be a cultivar of G. olivacea, a native of Western Australia. “Apricot Glow” is a tall shrub that will reach a height of three metres. Leaves are deep green, oval and similar in appearance to those of the exotic olive. The flowers are held in large, apricot coloured, spider-like heads and are conspicuous and profuse from late winter to early summer. Honeyeaters are partial to the flowers’ nectar. When grown in the USA, hummingbirds take over the role of our honeyeaters. The foliage provides a contrast with the attractive flowers. G. “Apricot Glow” is very responsive to pruning and may be hedged or trimmed to a size or shape suitable for many positions in the home garden.